We are very happy to share that Digital Badges have now been made available to the Service Automation Framework exams. A digital badge is an officially verified verification that can be used to share your accomplishments on LinkedIn or Twitter. Additionally, digital badges also allow potential employers to easily validate the candidate’s qualification as they will be able to click on the link given to them by candidate to see the relevant details if needed. 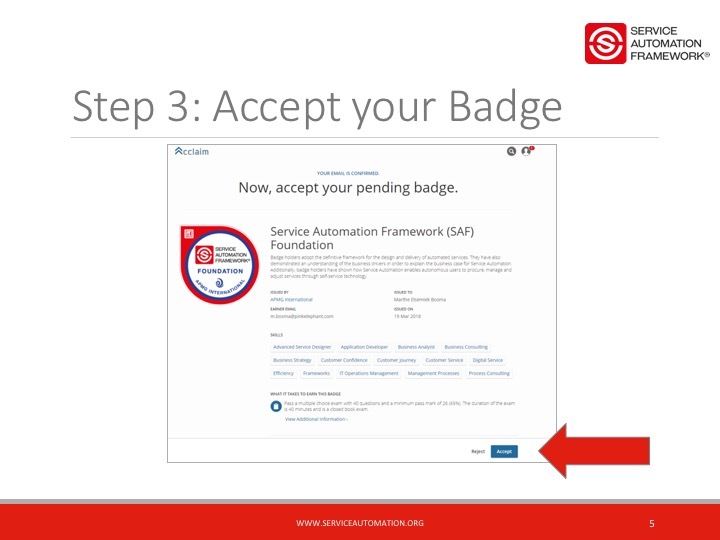 You can easily add your digital badge from your Service Automation exam with a number of very simple steps. 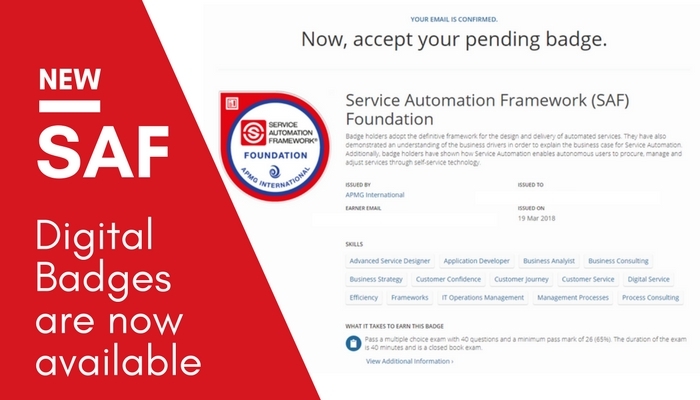 As soon as you have passed your Service Automation Foundation examination, you get an automated email from APMG-International that provides you with access to the APMG candidate portal. On the candidate portal, you can click a button to create your digital badge. 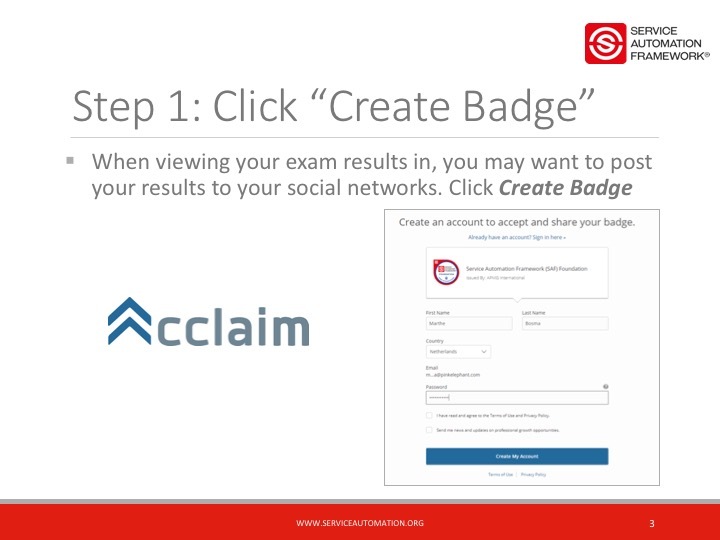 The Service Automation Framework Alliance and APMG have partnered with Acclaim in oder to facilitate digital badges. 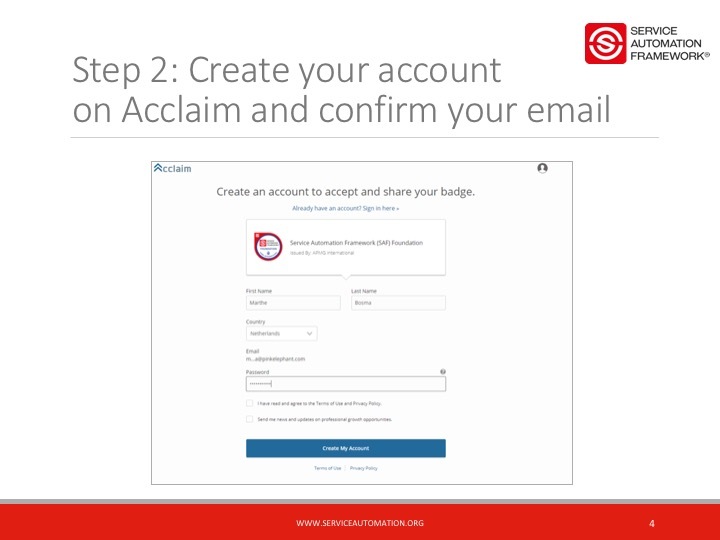 In order to show your badge (and other achievements or certifications), you will need to sign up for an account on acclaim. You will receive an automated email that you will need to confirm in order to activate your account. After your account has been set up in Acclaim, you will need to accept your badge. If you do not accept your badge, it will not become publicly available and cannot be reviewed by any third parties. You can easily accept your badge with the push of one button. Step 4: Share your badge with the rest of the world! All steps for setting up an sharing your digital badge have now been completed. On you account, the Service Automation digital badge has been added. You van now share it with the rest of the world through various social media by just sharing the link of your accomplishment!